Description based on: no.129 (May 1930); title from caption. 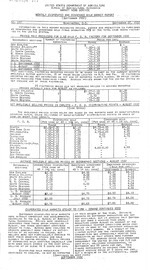 Latest issue consulted: no.224 (May 1938) "Prices paid producers for 3.8% milk F.O.B. factory". IES IN THE UNI TED STATES. .
2 PRICES PAID PRODUdERS FOR 3.5.4 M IL F.
NOT INCLUDE ANY OF THESE FACTORIES. APPROXIMATELY Jb% OF THE. TOTAL. FATGORI FPS IN TH-F IINITFb SfTA'TEf. TOTAL STOCKS ON SEPT. I, 1932 190,689 ,904 LBS. 20,537,330 .LBS. 11,600,731 LBS. SEPTEMBER 1, 1932 190,689,904 .Ls. 20,537,330 LBS. 11,567,091 LBS. AUGUST 1, 1932 '225,581,0;15 LBS. 21,446,986 LBS.. 12,517,977 LBS. SEPTEMBER I', 1932 190,689,904 LBS. 20,537',330 LBs. II, 176,996 LBS. SEPTEMBER 1, 1931 180,156,091 LBS. 22,504,109 LBS. 14,594,468 LBS. AUGUST, 1932 128,387,819 LBS. 4,757,737 LBS. 6,480,478 LBS. JULY, 1932 147,203,949 LBS. 5,236,111 LBS. 7,460,744 LBS. AUGUST, 1932 127,893,923 LBS. 4,757,737 LBS. 6,024,358 LBS. AUGUST, 1931 92,340,932 LBS. .6,353,525 LaS. 9,305,994 LBS. TOTAL STOCKS ON AUG. I, 1932 225,896,999 LBS. 21,446,986 LBS. 12,634,002 LBS. ESTIMATED PRODUCTIONAUG.1932 134,726,991 LBS. 4,936,759 LBS. 16,466,524 LBS. FIRMS, NOT FACTORIES. SOME FIRMS OPERATE MORE THAN ONE FACTORY. IN AUGUST TO 27 CENTS IN SEPTEMBER. MARKET DEMAND FOR THE MANUFACTURED ARTICLE.